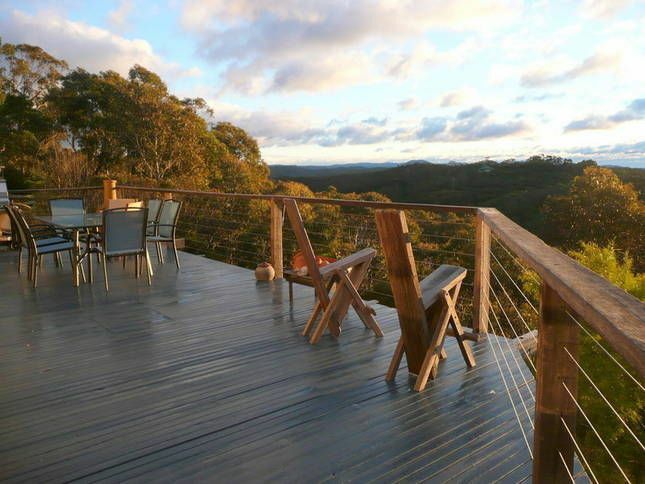 Nagual Retreat is the perfect holiday abode for families, friends and groups wanting to experience a most relaxing time in one of the best examples of earth architecture in the Blue Mountains. Nagual sits majestically with its 'big sky views' looking over the Blue Mountains World Heritage National Park facing Mount Hay. It features a Sante Fe style interior design with many interesting and creative details. A private photography collection is displayed throughout the house. This beautiful passive solar, eco designed house, is surrounded by a colourful garden and features a large deck perch, perfect for star gazing. Just a few minutes away is the Leura Village - with its famous mall of boutique shops and great cafes and restaurants and on the edge of the World Heritage National Park for stunning walks. Nagual Retreat is a fully self-contained 5 bedroom house. It has an upstairs as well as a downstairs living area, and sleeps 11 people so can cater for families, groups, or couples. - A comfortable dining room. - The property has 2 bathrooms with toilets. Lovely stay, adequate accommodation for 8 ladies. Spacious and comfortable. Refer to note left, re issues. The house was great overall. We had a great time at the house, it was spacious & well appointed. There were a few minor problems in that several bed side lights didn’t work, the exhaust fan in middle bathroom didn’t work, a dining chair was dangerously in need of repair & the oven was dirty. It really needs a good clean! Great house but air-conditioning and TV were not working. 34 degree without air-conditioning, we can only use the lower level of the house. Could not open some window as no fly screen to stop insect flying into the house. Thank you Florence , unfortunately while the heat wave was on ,we have been having a lot of Thunder storms , the Air Cond was hit by lightening along with the TV aerial , The Air Cond company had to order a new board which has only just been installed and fixed . While you were staying we did send a staff member over with extra fans and open the window's upstairs with the fly screens on . The Air Cond unit is nearly brand new as only been installed a year ago . Spectacular setting, lots of character, and what a view! Had a great family weekend! The house worked very well for our large extended family. Enjoyed the private location. Would book again.